Comic Might Now be Broken? For some reason, this comic does not seem to be working now. It doesn't work on Chrome version 57.0.2987.133 on Windows 8 in Massachusetts, even though it worked a year ago on the very same computer with version 49.0.2623.112 of Chrome in the same location (showing "Snake" then); I tried it on Internet Explorer on the same computer (only because it's the only other browser I have on it), and it didn't work there either; my brother grudgingly agreed to try it on Firefox on his Ubuntu 14.04 machine (in the same room), and we got the same result. Now, every time I tried on my computer, the browser said that the page was trying to load unsafe scripts. 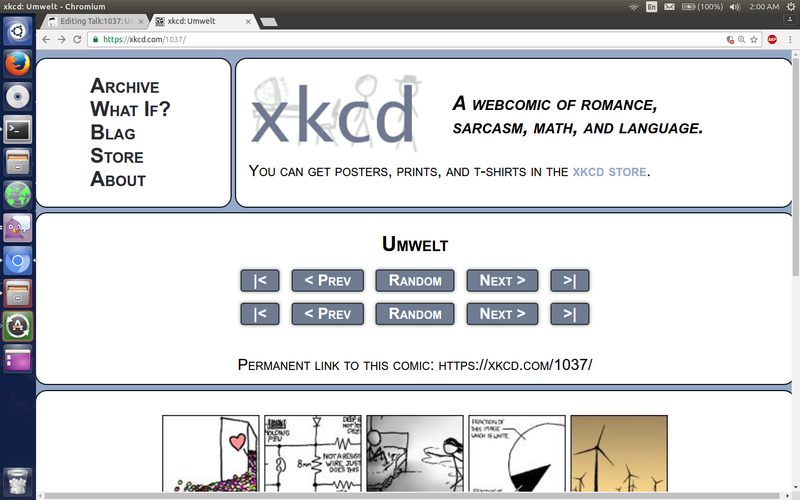 Maybe this is somehow linked to the fact that within the past few months, Randall (or more likely Davean) made all xkcd links secure (https://), and the now secure nature of the page could be blocking the location- and browser-sensing scripts in the comic itself. However, the comic still didn't work when I opted to "Load Unsafe Scripts", so maybe it isn't that simple. Anyway, with all that said, is there anyone else who is having this issue and/or knows what might be causing it? New location for long Too Quiet? I cannot access XKCD from Netscape 4.7 (i.e. a version from the 1990s), it gives a messagebox "Netscape and this server cannot communicate securely because they have no common encryption algorithm(s)." Now I can work out what's going on: XKCD is not allowing unencrypted connections / is redirecting plain HTTP requests to the HTTPS version, but the only versions of SSLTLS that NS4 supports are ancient, insecure and prudently not supported by the site itself. Now, if we assume that it's talking about still using NS per se, not 1990s NS: — the last version of Navigator was NS9, based on FF2.0. In FF2.0, I get "Firefox can't connect securely to xkcd.com because the site uses a security protocol which is not enabled." Looking in the options, it only offers two protocols (SSL 3.0 and TLS 1.0), both of which are enabled.